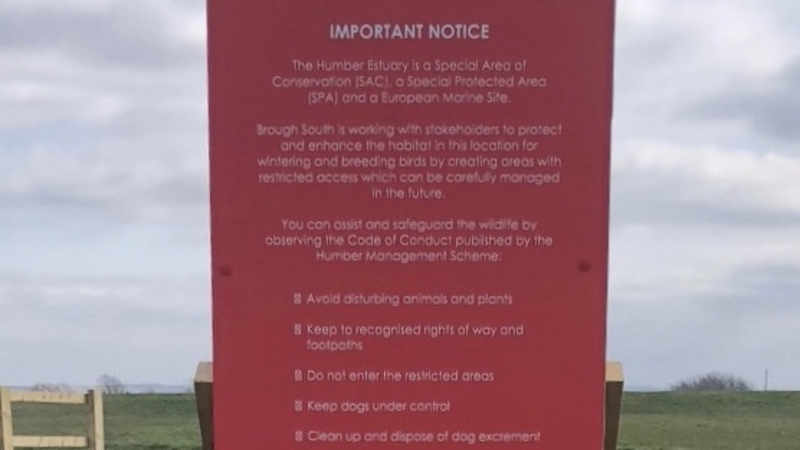 The Brough South Consortium would like to thank dog walkers and other recreational users of the former BAE airfield for observing new signs asking people not to disturb the surrounding land. The airfield is home to a range of ground nesting birds, some of which are endangered, and as such it has been designated an Ecological Management Area, to ensure the birds are protected. Recently, at the request of Natural England and East Riding of Yorkshire Council, we erected fences across the airfield to clearly identify the public right of way. We have also erected signage to let users know about the ecologically sensitive nature of the site, and why it is important they take care while using it. We are delighted to report that since the fencing and the signage have gone up, the numbers of walkers and their dogs inadvertently disturbing the area has significantly dropped, meaning the birds are much more likely to successfully breed. Ian Hodges, managing director of the Horncastle Group PLC, said he was delighted and very grateful that users of the area were abiding by the signs and keeping to the footpath. He said: “The former airfield is understandably viewed by dog walkers as a great area to exercise their dogs. “However, it is ecologically important and provides essential habitat for a range of ground nesting birds and their welfare must, of course, be taken into consideration. “As a result, the site has been designated an Ecologically Managed Area to ensure the birds get the protection they need to thrive. The public footpaths which surrounding the area still provide plenty of opportunity for dog walkers as they provide access to some lovely walks and spectacular views. Grass cutting operations, carried out by the Horncastle Group, took place on the airfield prior to the nesting season, as curlews and other ground nesting birds prefer shorter grass to better see predators. The RSPB has confirmed that since the grass cutting took place, up to 120 curlew, as well as redshank and snipe, have been spotted in the area, which is great news for the bird population non the Humber. The Horncastle Group is bringing forward the £200m Brough South Development with funding assistance from Homes England, on behalf of the Brough South Consortium. The consortium is made up of the developers, local landowners, Alma Jordan (Builders) Ltd, Riplingham Estates Ltd and BAE Systems.